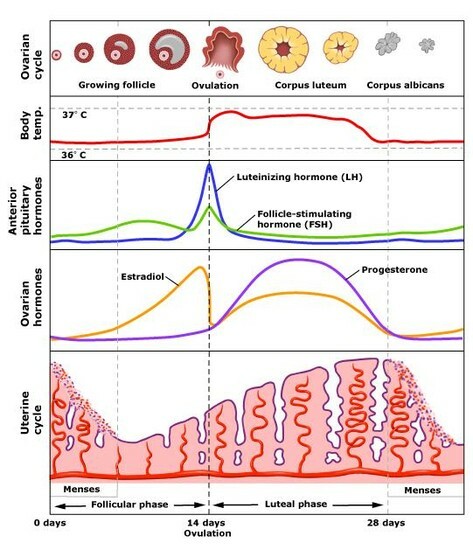 A 28 day cycle where the egg is released (ovulation) and the uterus is prepared to receive a fertilised egg. If the egg is not fertilised then the uterus will shed its lining as menstrual flow (sometimes called a period). There are names for each stage of the development of the fetus that you need to know. Development of the EMBRYO begins after fertilisation has occurred. The difference between an embryo and a fetus is that the enbryo is more about the formation of organs and limbs. The development of the fetus is more about growth (the embryo getting bigger).